It snowed a bit overnight! Not much, mind you – the road is just wet, but there’s about a cm or two on the rooftops and lawns. Snow is still falling, a little bit, with occasional bursts of wind carrying snow off the roof and making it look like it’s snowier than it is. Suddenly it feels like it’s really winter, even though it isn’t October NOVEMBER (yikes) yet! The snow should all melt today or tomorrow when it warms up a bit, and it’s supposed to be warmer for Hallowe’en, but somehow the first snow is just so potent in conjuring up real winter. 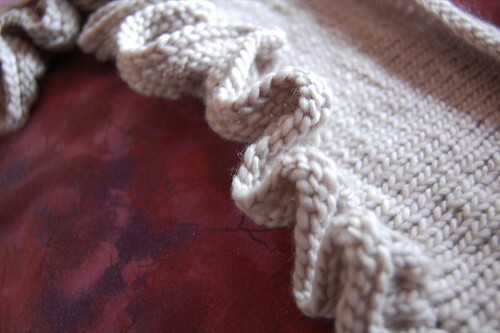 So, cold-weather accessories are on and off the needles! 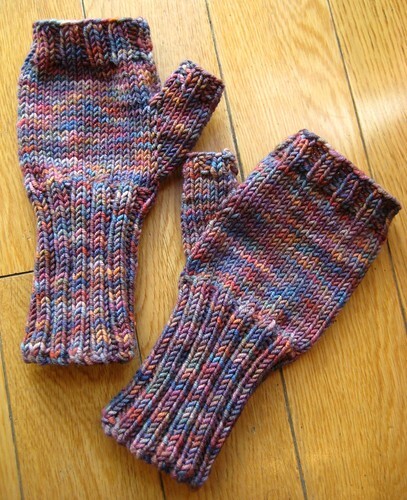 Some basic fingerless mitts, worked up in an Araucania yarn whose name escapes me at the moment. 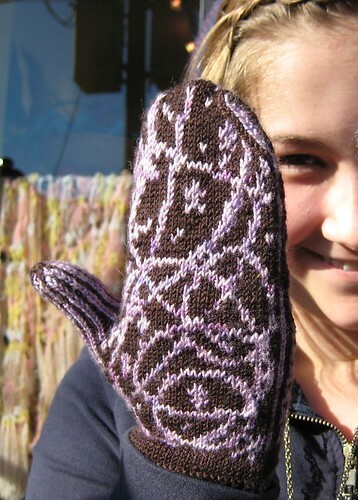 They’re too big for me, but that’s good – they’re a sample for the store and a basic pattern card for sale that I’ve worked up, and they’ll fit normal-sized medium/large hands! 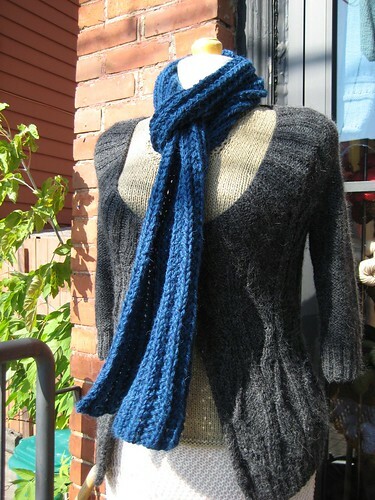 And in the ever popular Misti Alpaca Chunky, I knit up a nice long mistake rib scarf to show off the yarn – and to have something to show customers when they say “how much does one of these make?” (the scarf is 2 skeins, but 80″ long). 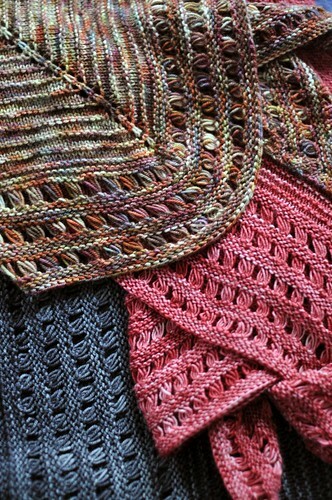 Just off the needles and onto the blocking towels, a ruffled scarf out of oh-so-yummy Malabrigo worsted. 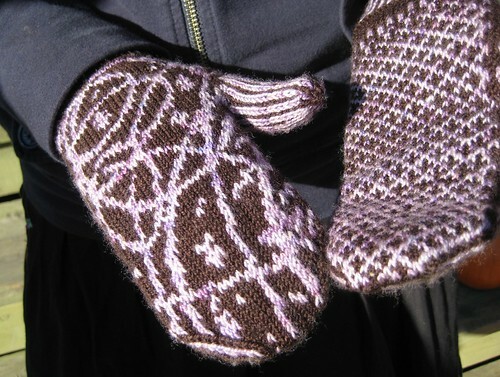 And these mittens that I’ve dubbed “Galileo Mittens” are done, worn, and the pattern is just being proofread. Soon, soon. Why does time move faster in the morning when you need to get ready for work? It’s a time warp! Went to the closest-by mall (which still takes a half hour by transit) to look for a dress for a wedding I’m attending next weekend. Found a suitable one at H&M, took a photo in the changeroom for my 365, and then went and bought the dress. Did a bunch of other errands, came home…and realized once I was on the bus right near my house that I’d left my camera (my Canon point-and-shoot) in the H&M changeroom.